At a small workshop outside of Paris, France, twenty-two of us – mostly Europeans except for two of us – got together to discuss the economics of the commons from an on-the-ground perspective. We wanted to identify promising avenues for future research, writing and political action. This was the third of a series of “Deep Dive” workshops that the Commons Strategies Group, working in cooperation with the Heinrich Böll Foundation, held in the fall of 2012. The two other ones were held in Bangkok for Asian commoners, and in Mexico City for Latin American commoners. This gathering, in Pontoise, France, was exciting because the participants were some of the world’s most serious, creative and internationally minded commons activists. The dialogues took place at La Bergerie, a lovely retreat center run by the Charles Léopold Mayer Foundation, which graciously hosted the event. Our talks probed the conflicts and contradictions in commons thinking, and tried to get each of us to look beyond our own issue-silos and subcultures. I recently completed a 23-page interpretive summary of the workshop, which can be downloaded here. 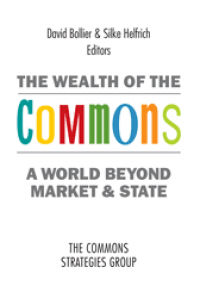 The report examines such issues as how shall we conceptualize the commons; whether commons have intrinsic purpose or not; the tensions between liberal constitutionalism and the commons; and future steps in building a commons paradigm. Below, I excerpt a few portions of the report that strike me as especially interesting. …a connecting structure (natural or artificial) organized around integrative institutions by a given group of people (Giacomo D’Alisa). Understanding humankind as inherently cooperative and social – i.e., “more than rational.” This view implicitly critiques the homo oeconomicus model of human beings that conventional economics is based on. A needs-based philosophy (as opposed to an interest-based one) that strives to enact equalitarian social and political principles. This principle recognizes that one’s economic conditions are a precondition for political participation and are, in fact, the material base of our lives. Acknowledging environmental limits and the material basis of human society. This perspective must then be integrated into all human practices and governance systems. Democratic participation in horizontal self-governance. The goal should be to broaden the realms of our lives that are based on democratic self-management. 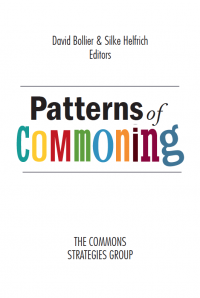 In defining a commons, said Silke Helfrich of the Commons Strategies Group, “it is very useful to distinguish between commons and common-pool resources.” The resource is not the same as a commons. “It is analytically misleading to define a commons based on the characteristics or type of a resource,” she said, “because the status of a resource as a commons is something that a community decides.” The distinctions about whether a resource is a public good, club good, etc., are less important than whether a community (or a network) decides that it regards a resource as fundamental to human life, culture and livelihoods. Thus, a commons is not simply the equivalent of a “public good”; nor is it a “common good” in the sense that economists use the term. 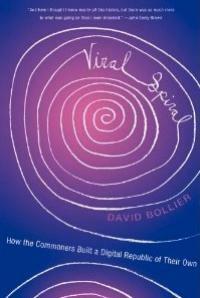 Do commons have an intrinsic purpose? Helfrich was adamant that “the commons is not about organizational form or property rights. It’s about the purpose. If commoning ends with a sale on the market, then what about all the other people who have a stake in the process of commons-based production?” “Open” systems give no guarantee that the long-term social or ecological interests of contributors will be respected or protected. The World Bank took a keen interest in the Commons two decades ago, said Larry Lohmann, “because they saw it as a way to mitigate some of the more dangerous effects of their own neoliberal doctrines. For example, the Commons provided ‘escape hatches’ to help unemployed people subsist. The commons was something that the World Bank could promote. This is just one of many other examples [of the co-optation of the commons], such as the use of Facebook for surveillance and data-mining of people’s social connections,” he said. For Helfrich, such examples illustrate “why we need a shift from commons-based peer production to commons-creating peer production.” In other words, she said, the commons must have the capacity to protect and reproduce itself. It must have within its very structure the capacity to assure its own longevity and self-protection. Otherwise, capitalist forces will simply be able to free ride on the commons (e.g., open access, open source), convert it into an instrument of conventional market production, and perhaps even destroy the commons. 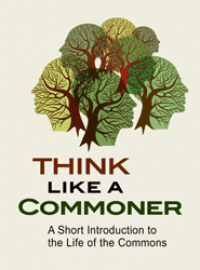 Commoning would simply become another “market input.” It is therefore important that commons are capable of capturing the fruits of their labor, and that the commons can re-create themselves and other commons. “Under modern constitutionalism,” said Saki Bailey, “citizens cede their fundamental rights to the state so that they can be legally enforceable.” Unfortunately, she said, the nation-state and liberal constitutionalism have been vehicles by which private appropriation of common goods has occurred. The state model of individual rights has been essential to the breakup of collective management, as seen in the decimation of Native Americans and First Nation peoples. Stefano Rodotà said that, for him, the commons means that there are some goods that are so fundamentally related to human rights, as opposed to economic rights, that that they must be treated as common goods. Liberal constitutionalism is not going to protect these rights or the commons, he asserted. Rodotà noted that the very idea of human rights was bourgeois in origin, and based on liberal constitutions. “But we had a second revolution after World War I, during the Weimar Republic, in which social rights – and implicitly, the interest of the working class – were recognized. “We cannot understand the modern state without this reference,” he said. Another interesting development, said Rodotà, is “how creativity and labor are occurring inside the commons.” Since there are new ways of extracting surplus value in the digital domain, we need to consider recognizing rights there as well, he said. A helpful book on this topic – and on the use of social action to “property disobedience” to change the scope of property law – is Property Outlaws: How Squatters, Pirates, and Protesters Improve the Law of Ownership (2010), by Eduardo M. Penalver and Sonia Katyal. Larry Lohmann agreed with Rodotà that the right to survival and subsistence is one of the key justifications for making resources common goods, especially in the global South and in pre-19th Century Europe. He noted that John Locke and, in a more extreme way, Thomas Malthus, cited the imperatives of “Nature” to argue that people actually don’t have a right to survival. “Malthus’ position lies near the beginning of an anti-commons tradition that runs all the way down to Garrett Hardin, whose main mission was also to provide an ideological justification for the extinction of the right to subsist.” This view is shared by most if not all of today’s technocrats and orthodox economists, as well as political figures like Mitt Romney, he said. This has provoked an important, continuing historical struggle: to declare that everyone has the right to survival. To complicate this scenario, however, Lohmann made another point – “that a universal right to survival may not necessarily be compatible with the right to exclude, which is necessary to commons. This is an apparent tension that we need to acknowledge.” Yet he went on to suggest that, when we examine how the right to exclude is articulated in particular cases, we may find that this tension is more imagined than real. For example, forestry commoners in rural Thailand may object to someone who uses hired labor and pickup trucks to sweep through the forest to take all the mushrooms to sell on the market – but they may well be quite tolerant of the vagabond who is picking mushrooms because he’s hungry or the tourist who wants a snack. Their principle of exclusion, in other words, tends to be applied less to outsiders as such than to capitalist outsiders. 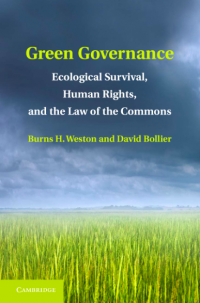 They are not “managing ecosystems within biophysical limits” but rather defending commons (subsistence rights) against capital (the right to accumulate). But in all cases involving strangers, they would probably have to discuss among themselves what to do before deciding what to do. There was general agreement that building new alliances requires the creation of new enabling structures for commoning among diverse communities. The point is less about “pushing out” ideas and messages about the commons that about opening up an ongoing process and “spaces” for dialogue so that commoners can co-create new structures and initiatives. 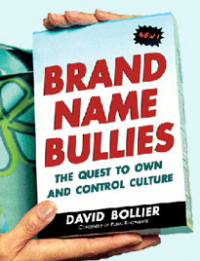 Instead of seeing future challenges as one requiring a “grand overview” and a “blueprint for action,” said David Bollier, “we need to see the challenge as “building an ecosystem over time.” That means building discourse, enabling connections and developing new social and knowledge circuits. It must be an organic social process that is collectively driven by the participants themselves. Frédéric Sultan of Remix the Commons added that the real challenge is finding ways to “develop connections between the cells of this ecosystem.” We need infrastructures to support commons work that are fairly neutral so that connections among people can more easily develop and have universal reach. While different participants had different emphases, most of the discussion revolved around the idea of creating clearinghouses for knowledge exchange, enabling structures that host dialogues and collaborative planning, and mapping initiatives that help identify the range of commons-based activity already occurring. Again, the full European Deep Dive Report can be downloaded here.